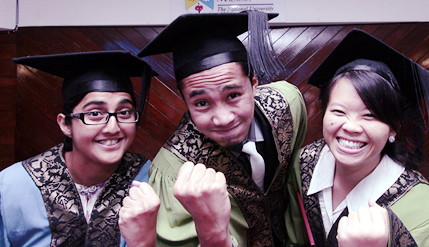 BANGI, 2 Nov 2012 – Three graduate students of The National University of Malaysia (UKM) from three entirely different backgrounds became very close friends and earned their Masters degrees together at the recent 40th Convocation of the univesity. The three, Mohd Faradi bin Mohamed Ghazali, Terry Woo Kit Wan and Jasminderjit Kuar a/p Shabag Singh first met when they registered to stay at the residential Kolej Dato Onn (KDO) when they enrolled in the university five years ago and had been together as very close friends since. Each pursued different courses of study but during the course of the five years they were all involved in various activities of the college becoming very close friends ending with being Fellows together at the college when each of them continued their post graduate studies after getting their bachelor degrees. Faradi, 26, studied Malay Literature at the Faculty of Social Sciences and Humanities and continued for his Masters also in Malay Literature. Terry Woo did her first degree in Linguistic Studies also at the Faculty of Social Sciences and Humanities and then continued to study for her Masters also in Linguistic Studies. Jasminderjit Kuar, 25, took up Monetary and Fiscal Economy at the Faculty of Economics and Administration for her bachelor degree and continued for her Masters in the same subject. During their five years in UKM, they were involved in many of the college’s activities together gaining new knowledge and skills. “It’s weird, when we all first met, we were not this close, but after a time and a lot of KDO activities together, we’ve become close,” Faradi said. “We were all from different races and religions, so when we first started to know each other we also got to learn about each other’s beliefs. So of course there was some awkward moments and the feeling that you are lost in translation, but in the end we learned something new and we could understand better and respect each other’s beliefs,” said Jasminderjit. Like all friendships, the three of them had their ups and downs. There were times in the course of the friendship when they had quarrels or misunderstandings. “But none of us have ever had any ill will or misconception or bad presumption towards each other. We accept each other as we are and accept that each of us are genuine and transparent in this relationship,” Faradi explained. They had taken part in many of the college’s activities. For Terry and Jasminderjit, they had both served as JAKSA for KDO. Terry having been the Treasurer for JAKSA while Jasminderjit served as The Integration and Racial Unity JAKSA, while Faradi had entered many artistic competitions for KDO. “I like to be active in programmes such as arts and culture and have represented the college in poetry events, dance performances, singing and also in the field of hosting,” Faradi said. Agreeing Jasminderjit said that their experiences in KDO have allowed them to not only learn new things but to also grow and mature to be useful members of society. “The staff and management in KDO have all had a positive impact in our lives. Our college Principal, Associate Professor Datin Noor Aziah Hj Mohd Awal has been instrumental in moulding us to be who we are, giving us tasks and responsibilities that she knows we can handle and succeed in, therefore making us stronger and more mature,” Jasminderjit said. The various activities that they were involved in enabled them to interact and meet with many different people. They all agreed their ‘training’ in KDO has helped them overcome their shyness, lack of confidence and have polished their ‘people skills’. “As JAKSA’s and Fellows we have acquired soft skills and management skills that we could not have received had we just studied and not participated in the college activities. These skills are invaluable to me,” Faradi said. As Fellows in KDO, they took part in many off campus activities, usually community outreach programmes or school programmes where they would travel and interact with the local communities. Jasminderjit said to the world outside of UKM, it might seem odd for the three of them to always go out together. “We go out to eat together, we go to movies, go shopping, it’s all fine with us. But yes, people do give curious looks while we are out, a confused look. But no one has been hostile about it, just curious,” she adds. They also have received positive comments and even praise for their friendship by acquaintances, friends and strangers. “We were on a college trip to Redang Island and we were taking photos on the dock and there was this ‘Pak Cik’ watching us goofing around, he said: “Its heart-warming to see the three of you being good friends, it’s difficult to find three races being this close as friends” .”That was very sweet,” Terry said. Commenting on the friendships that they have built in the five years being in KDO and UKM, they all agreed that if they had do it all again, they would not do it any differently.